It’s FRIDAY, yahoooooo! Any fun weekend plans? Not me, cannot think of anything I am doing for sure. Maybe catch a movie since it’s supposed to be rainy Sat and Sun. 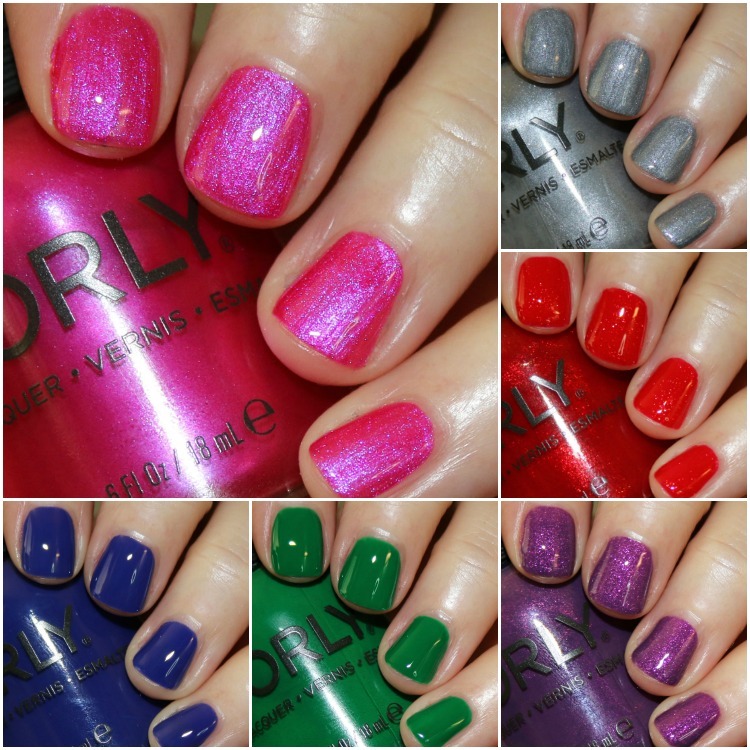 Today I’ve got the new ORLY Sunset Strip Holiday 2016 collection for you. This collection consists of six new shades in various finishes. I love that so many brands this year are thinking outside the box with their holiday collections! It seems like most of them have quite a few shades that aren’t necessarily classic “holiday” colors, and I dig it. Up All Night is a medium grey with silver shimmer. This is two coats. Celebrity Spotting is a medium orchid purple with heavy gold and pink shimmer. This is two coats. Last Call is a bright pink fuchsia with heavy blue/purple shimmer. This is two coats. Invite Only is a medium, bright forest green creme. This is two coats. The Who’s Who is a deep cobalt blue creme. This is two coats. Sunset Blvd is a bright cherry red crelly with lots of gold and red shimmer. This is three coats. Such a great set of colors. I am especially partial to Celebrity Spotting, Sunset Blvd and Up All Night, but I really like all six of them. I think Celebrity Spotting is THE stand-out color here because it’s so unique. However the finish and look of Up All Night is really cool looking also. It doesn’t look like a standard grey shimmer – it’s special somehow. I also love Last Call, but think there might be a lot of pinks out there like it. Normally reds don’t wow me all that much but Sunset Blvd is really gorgeous! Invite Only is actually much more of a bright green in person and it’s really nice as well. The Who’s Who is a nice deep blue that verges on being blurple but comes off as more blue on me. You can find the ORLY Sunset Strip Holiday 2016 collection on their site and in stores now and they are $8.50 each. Are there any shades here you are going to be picking up? I love all the shimmer ones. It’s reminding me I really need a pedi! I was immediately drawn to Up All Night – but I really like Celebrity Spotting, as well. That grey is interesting. I’m a sucker for greys. The red shimmer is great too, although didn’t Orly do a red shimmer last holiday season that is almost identical to this one? I have it but I don’t recall the name of it.